Location: Fresnicourt-le-Dolmen, in the Pas-de-Calais departement of France (Nord-Pas-de-Calais Region). Notes: Château d'Olhain is a fortress of the thirteenth and fifteenth century. It is located Fresnicourt-le-Dolmen in the Pas-de-Calais, on the Lawe. 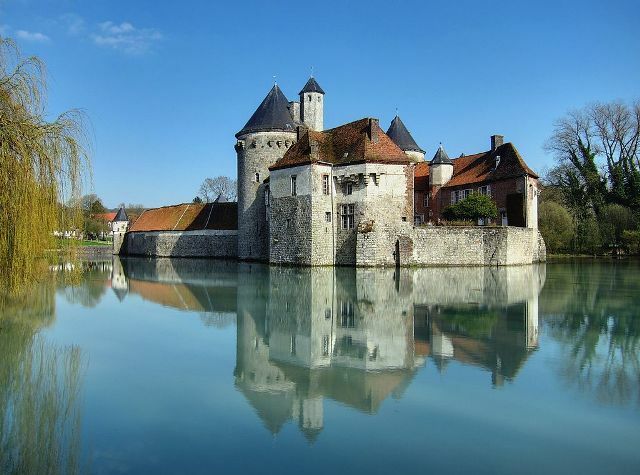 It is the finest example of a medieval fortress of the ancient region Nord-Pas-de-Calais.Family Olhain is one of the oldest family of Artois, but the industry is gradually lost with the marriage of Mary and John Olhain Nielles. The castle has stood for war, has seen Charles Quint. One wing of the castle, overlooking the widest part of the moat (about eighty meters), was shot dead. Culverins date from the Spanish incursions, but the towers were redesigned since because the castle, abandoned for a long time, had deteriorated. The kitchens in the cellars were built between Merovingian walls. It is the subject of a registration as a historic monument since April 12, 1989. The castle is open to visitors during the summer, only the farm is inhabited.